Forest officials say the work by Majhi and local tribals in Kalahandi is an important step in guarding the forest resources. In a region where deprivation sweeps away any shred of hope and optimism, Kartik Majhi stands out. The septuagenarian Kondh tribal from Kalahandi’s Boringpadar village may not have studied much, but has brought cheer and hope to a place where death is an annual feature. In 1979, Majhi started planting sapling on the 97 acre barren land adjoining a hillock near his village with support from the Nehru Yuva Kendra. Villagers who used to grow millet on that land had no idea what Majhi was up to, but grudgingly came around to support him for next three years. 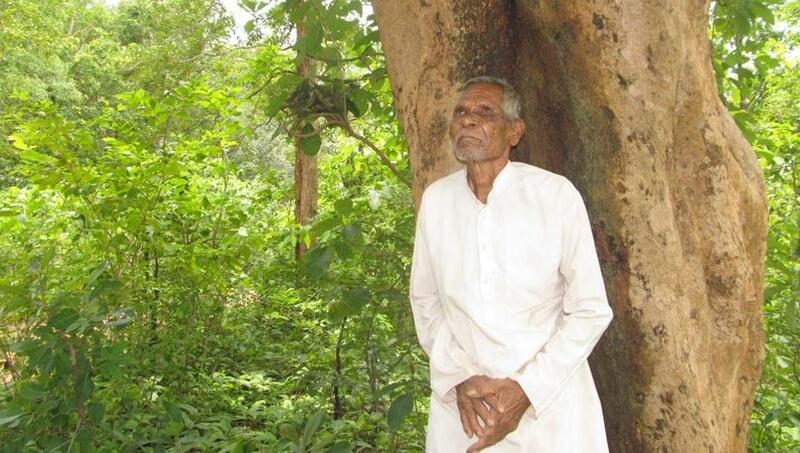 Some 35 years later, the 97 acres of once-barren land near his village is home to a luxuriant forest consisting of Sal, Teak, Acacia, Chakunda and several other timber and fruit-bearing trees. In the process, he showed the ability of free Indians to battle the most adverse of circumstances, and the transformation that takes place when society and state collaborate. “When I was young I came to realise that without rains we would not have any hope. My father told me that the only way we can have regular rains is through forests,” said Majhi. 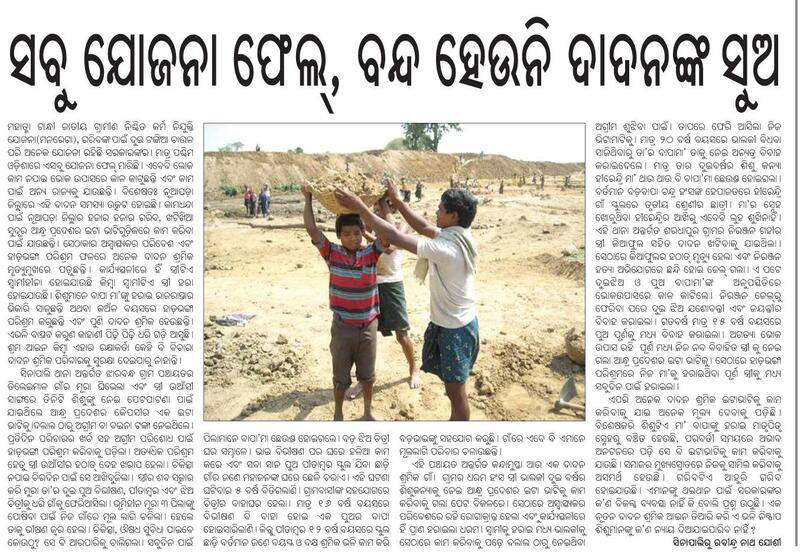 This was the time when a young Majhi got serious about ways to prevent drought. With some handholding by local forest officials and help from Nehru Yuva Kendra in Bhawanipatna, Majhi and his elder brother Bali through Boringpadar Yuvak Sangha started planting saplings on the barren land, that was recorded as forest in government files. Soon the rest of the villagers joined in. The remunerations were not great – all that the villagers got was a sack of potatoes and two sacks of rice. “At times when people were not willing to go for planting, I used to mortgage my umbrella and utensils at home to pay people and a security guard to keep an eye on the saplings,” said Majhi, standing next to a sal tree which he planted. Tejiraj Pradhan, a young farmer, still remembers how he used to plant saplings with Kartik mausa. Ten years later as the saplings grew in length, the once-barren area sported a different look. “It was like seeing a desert bloom,” said Majhi’s friend Kirtan Majhi. Impressed with his work in creating a forest out of a barren land, the forest department in late 90s entrusted Boringpadar Yuvak Sangh the task of looking after the 500 hectares of reserve forest near his village. The villagers also keep an eye on another 500 hectares of forest near the hills adjacent to the village. Forest officials say the work by Majhi and local tribals in Kalahandi is an important step in guarding the forest resources. “Creating a forest and guarding can never be done by the forest department if individuals like Majhi are not involved. A forest guard is supposed to guard an area of 20-25 km. Is it possible on his part to keep an eye on so large an area,” asked Suresh Pant, regional chief conservator of forests of Bhawanipatna. Despite efforts by Majhi, old-timers of the district are not so hopeful of seeing the luxuriant forest cover of mid-80s when 50% of its geographical area was under forest cover. The last Forest Survey of India published in 2015, put the forest cover at 30%. “The success of people like Majhi is important, but it’s very difficult to get back what we lost,” said former Kalahandi MP Bhakta Charan Das. Now 75, Majhi can’t walk properly and has problems in his sight. But his son Shankar seems to have inherited his father’s legacy as he goes to the forest with his friends to keep an eye on anyone cutting forests. This year a dozen villagers entered the reserve forest area and tried to cut the trees. They were promptly fined Rs 6,000 by the Yuvak Sangh volunteers. Majhi says forests are intrinsic to the well-being of tribals. “We can’t always travel to the hospital in Narla block, which is 15 km away. If we suffer from malaria, we take crushed leaves of Nyctanthes, black pepper mixed with honey. The forests give us everything. Jungle is mangal for us,” said Majhi. The Socio Economic and Caste Census (SECC) 2011 has in one stroke not only demolished Odisha’s growth story spun by the Naveen Patnaik government over the past one-and-a-half decade but also laid bare an embarrassing failure of its much-vaunted welfare and poverty alleviation schemes. It cannot be a more damning indictment of the inefficiency than the fact that more than 66 per cent of the population in rural Odisha still continues to languish in acute deprivation without access to basic needs such as food, housing or income generation means. The findings of the census has countered and exposed the hollowness of the government’s claims at every point. While the State Finance Minister painted a glowing picture of the socio-economic rise over the last decade, projecting a growth of eight per cent in 2015-16, the census report has presented a worrying scene. Over 46.6 lakh (54 per cent) of the total 86.22 lakh rural households are landless and 23 lakh households have only one room with kutcha roof to shelter whole families. A whopping 87 per cent households manage with a measly income of less than Rs 5,000 a month. In the face of the Government’s claims that poverty has been reduced by almost 25 per cent and socio-economic conditions for a vast chunk of the population have been improved, Odisha has been ranked among the top four states in the country in terms of beggary with over 54,000 households depending on it while as many as 22,353 households resort to rag-picking and rummaging garbage dumps for their livelihood. Further, almost 59 per cent of the total households are engaged in manual and casual labour. The census practically serves as a report card on the schemes and measures implemented by the government, revealing their failings and fissures. Despite the flagship Rs 1-a-kilo rice scheme, claimed to cover over 58 lakh households, and programmes for housing, irrigation, farm assistance, skill development and employment generation, the poverty and deprivation situation has not improved as much. The government should re-examine the schemes to reach the beneficiaries at every level and draw up strategies for more focused implementation of poverty alleviation and development programmes. Lalit Bhoi of Badbanki village in Turekela block in the district has decided to migrate in search of job as he is not able to get work even after applying for Mahatma Gandhi National Rural Employment Guarantee Scheme (MGNREGS). Similarly, Surdas Pradhan of Bijamal village in Muribahal block feels that he would migrate if he would not be able to get work under the flagship scheme soon. Bhoi and Pradhan are not solitary instances of poverty stricken people unable to get the benefits of MGNREGS. In fact, the MGNREGS, aimed at providing employment to rural poor, has miserably failed in the district. According to sources, 2,72,527 households in the district have been issued job cards. Out of them, 61,339 households applied for works in 2013-14 and 47,393 households have been provided work till now. While in the present month, 5,904 households are engaged in work, 2,086 households have completed 100 days of work. Among those who completed 100 days of work, 463 households were linked to the housing schemes like Indira Awaas Yojana. According to latest estimate, about 68.2 per cent of the budget for the scheme has been spent till now including labour payment and construction work. The major road blocks in implementation of MNREGS are non-payment and delayed payment of wages to the labourers and shortage of field staff for preparation of muster rolls. Sources said people are not getting work during lean period. They also alleged that the officials were providing work as per their whims and caprices. As per a conservative estimate, more than one lakh people have migrated in search of livelihood from the district to other places in and outside the State. The district has also more than 1,000 certified bonded labourers. According to a survey of Western Odisha Migration Network (WOMN), a network of civil society organisations and academicians working in the district, more than 80,000 people from Bangomunda, Turekela, Belpara, Muribahal, Saintala and Khaprakhol blocks have already migrated. 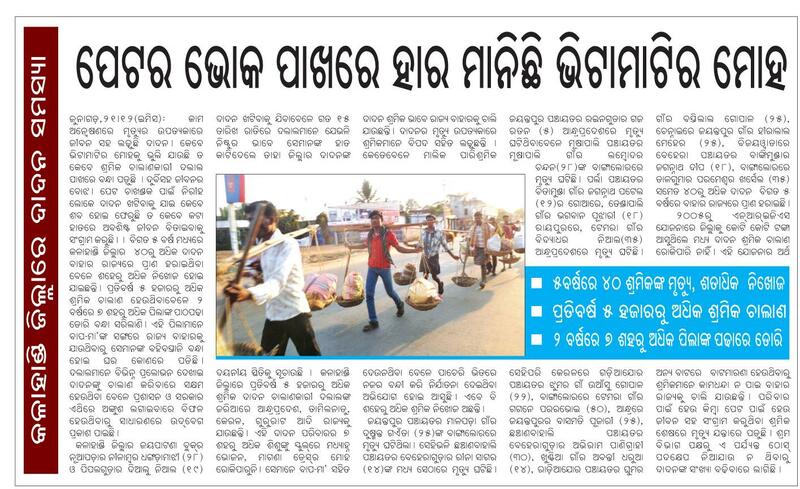 “Balangir is a poor and migration prone district. MGNREGS has all the ingredients to address labour migration due to acute poverty and unemployment. However, to realise the same, the administration needs to identify the vulnerable people and implement MGNREGS during the lean period. But it has failed to provide timely works as well as the payments,” said Jatin Kumar Patra, an activist working on the issue. Project Director of Balangir DRDA Pabitra Mandal said the administration is taking steps to provide work in all the revenue villages. “We are preparing plans and very soon the works will start,” he said. BHUBANESWAR: The State Institute of Hotel Management in Balangir has decided to train children of migrant labourers of the district in food production and food and beverage services to check further migration. After training, they would be employed in the local hospitality industry. Those, who have studied at least up to Class VIII, and have attained the age of 18, will be eligible for the free-of-cost training. “The programme is being started keeping in mind the large-scale migration that Balangir district witnesses every year. We will go to the migration-prone areas to identify eligible candidates from among the children of migrant labourers,” said Chandrakanta Mohapatra, principal of the institute. While the food production training will be of two-month duration, food and beverage services training will continue for one and a half months. The training programme will be free of cost with the Centre sponsoring it under its ‘Hunar Se Rojgar’ scheme. “We have the capacity to train 350 students, all of whom will be from the migration-prone belt. However, others who fit in the eligibility criteria can also join the training. Out of Rs 27 lakhs funded by the Centre, Rs 13 lakh will be spent on the training, said the principal. He also said more children would be gradually incorporated into the programme under the state government’s Nijukti mission. A total of 375 students might be accommodated by the end of March, said the principal. ‘After the training programme is over, we will ask hoteliers to recruit the trained youths. Since urban Balangir has many good hotels, there won’t be any problem in placement,” said Suresh Kumar, a trainer. He said free uniform, tools, food and accommodation will be provided to the trainees. After completing the training, students will have the option to be self employed as well. The food craft institute was up-graded into a hotel management institute in Balangir to boost up tourism and hospitality industry in the region and generate local employment. Earlier, the institute has set a record in giving training to roadside dhaba owners across the district. A massive job guarantee programme in form of NREGA, government’s claimed strict monitoring of migration and employment generation within the State due to industrialisation have failed to check migration from poverty stricken KBK region to other States. A latest study that covered 100 villagers of Kalahandi, Bolangir and Nuapada district finds migration has risen in all three districts. The disturbing factor, which is common among villagers in all three districts, is that they are ‘forced’ to migrate. In Kalahandi, the study covered 1,872 population of 401 migrant households. Out of which 51 per cent were men and 49 per cent were women . About 84 per cent of the educated population have been migrating while 16 per cent stayed back in the villages. About 97 per cent villagers interviewed said they were migrating due to reasons those were beyond their control – forced migration. In Nuapada district the study covered 581 households with a total population of 2,500, out of which 1,244 were male and 1,256 were female. It was found that 88 per cent of people of the total households were migrating for livelihood. Migration increased by 20 per cent in the villages from 2009-10 to 2011-12, the finding says. Similarly in Balangir district, the study was carried out among 4,311 villagers in 981 households out of which 90 per cent of the population were migrants and rest 10 per cent stayed back at the villages. According to the study, migration increased 83 per cent in last three years. From 2009-10 to 2010-11 it witnessed an increase of 37 per cent but last year the migration shot up vertically. Aide et Action, a non-government organisation, in collaboration with International Labour Organisation and the State government had carried out a micro-level study on vulnerability and migration in 100 villages of Bolangir, Kalahandi and Nuapada to assess the aspects, processes, factors, incidence and impact of migration. The objective of the assessment was to conduct an in-depth analysis of the distress as well as to capture the process of labour migration and suggest ways and means for reducing distress and devise strategies for smooth, safe and protected migration of the migrant labourers going particularly to Andhra Pradesh and other parts of India. “The findings are disturbing. Almost all migrant labourers were small and marginal farmers. Children constitute about 23 to 30 per cent of migrant labourers. NREGA did not achieve its desired goal of providing jobs to rural folks. We found distress migration in almost all villages,” said Umi Daniel of Migration information of Resources Centre (MiRC) of Aide et Action. Factors those contributed in migration were no work in villages, failure to repay loan and crop failure. Very few (2 per cent) said they were migrating for better earning. “We invariably found that people had no works in monsoon season starting from June to September. If MGNREGS could be redesigned for creating jobs during this lean period, people would not go for taking loans. And majority of migration could be checked,” said Mr. Daniel. He said the State government had very weak registration mechanism to document how many labourers were migrating to other States. At many places anti-migration cells were not even working.